Know your allies from afar and identify your target before opening fire. 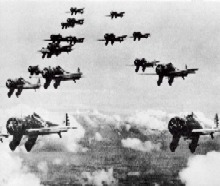 P-26 formation enroute to target. The yin of the High Yo-Yo's yang, this turn will allow you to gain velocity in a turn on the target. If you are approaching stall speed, the Low Yo-Yo can help you pick up the pace. 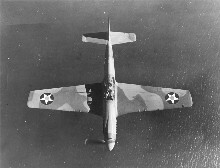 When the target makes his breaking turn, drop the nose of the aircraft below the target. Gain speed in a diving turn and pull up into the target. You will be at full throttle and turning as tightly as possible. If you gain extra lead on the target, he should turn right into a well timed blast from your guns. In this case, poor execution will allow the target to gain an advantageous altitude over you. If your speed is too great, you will gain even more momentum and will not be able to turn sharply.